LA, U.S.A (MPR Consulting) - As dancehall and reggae music becomes more prevalent in international mainstream music, Asia's love affair is nothing new. All facets on dancehall and reggae has always been not only loved and respected, but often emulated. The latter very descriptive and embodies pop singer Che'Nelle who was born in Malaysia, raised in Australia, and living in Los Angeles became a celebrated pop star in Japan. CheNelle is a truly unique blend of culture and genres, infusing traditional pop with elements of rock, soul, and R&B to incorporate the different cultures that she’s experienced. Discovered on Myspace, signed to Virgin Music and then catapulted into a star in Japan, Che’Nelle quickly became a household name. Hit songs 'Baby I Love You', 'Believe', and 'Happiness' earning multi-platinum certifications has coined Che'Nelle as the "Princess of Love" in Japan. strong year for Che’Nelle, single ‘Kiseki’ is the theme song to Warner Bros Film Romance Theatre distributed throughout Asia. Additionally, as a songwriter, Che’Nelle has landed placements for Fox’s Empire single ‘Never Been This Hard’, and M-Net Korean Boy Band competition TV show Produce 101 for single ‘Pick Me’. 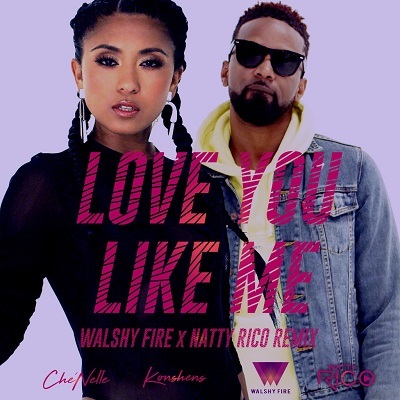 Boasting so many accomplishment in her career, the multi-talented singer recently teamed up with super producer Walshy Fire, dancehall star Konshens and French musician/DJ Natty Rico on the remix of "Love You Like Me". The hit bound track off her recent EP "Calm Before the Storm" has been gathering steam on international airwaves with its catchy lyrics and infectious beat. “It was my first time having so many features bless a record. Konshens gave the record extra light, but when Natty and Walshy joined the remix, their productions and sounds of the sax really pushed the song to a whole new level!”. - Che'Nelle"